Austin Yorke’s 3D Foundations (ART1203) class recently completed an exciting and challenging project! 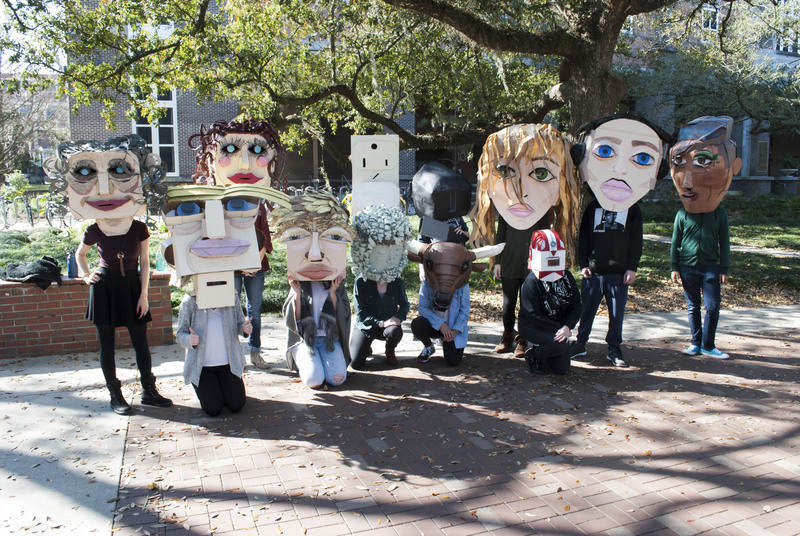 The students, in pairs of two, constructed two wearable cardboard heads and performed in them in and around the Oglesby Union. The assignment was rather loose, they had to research a “relationship” between any two things (people, animals, governments, events, etc.) and embody the relationship through wearable sculpture and performance. The relationships chosen were Daedalus&Minotaur, Plug&Socket, Young&Old, Trump&Trump, Headphones&Humans, Human&YouTube.